Hello everyone, its Orktober again, and its nice to see so many people painting Orks in celebration of the happiest time of year. GW have done well, releasing some properly Orky vehicles and a new game that I might pick up if I find a spare ninety quid at some point in the near future. 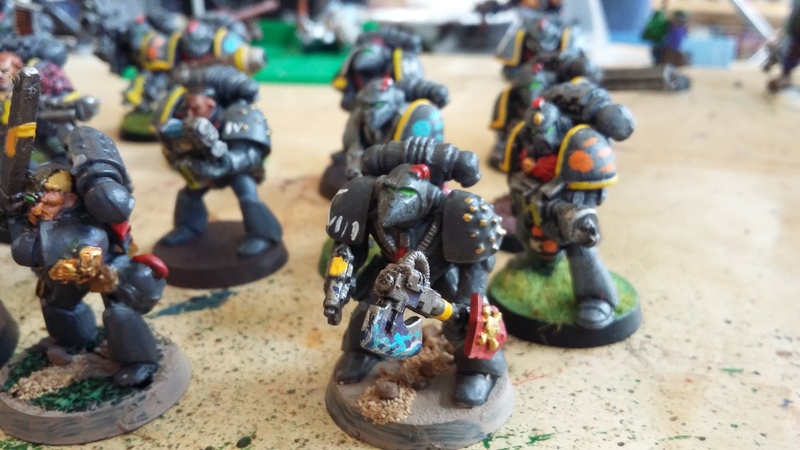 My Orktober has mostly been spent packing boxes, as I am moving house, and indeed country. I am moving to Caerdydd, where they speak a different language. 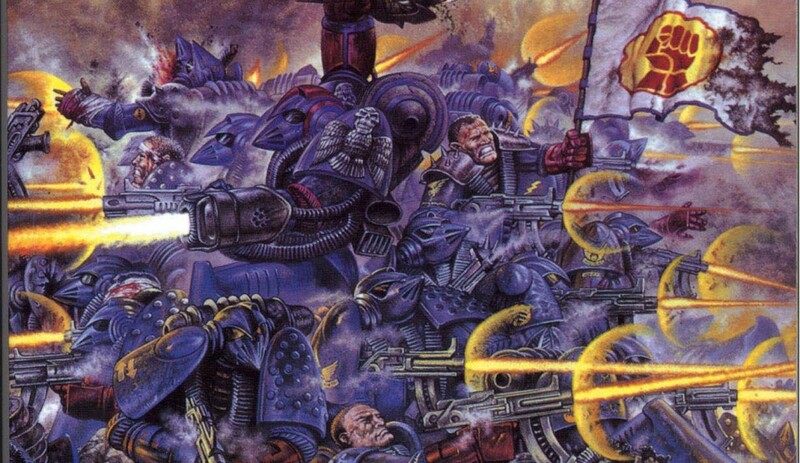 What’s Welsh for “more dakka, ladz!”?? 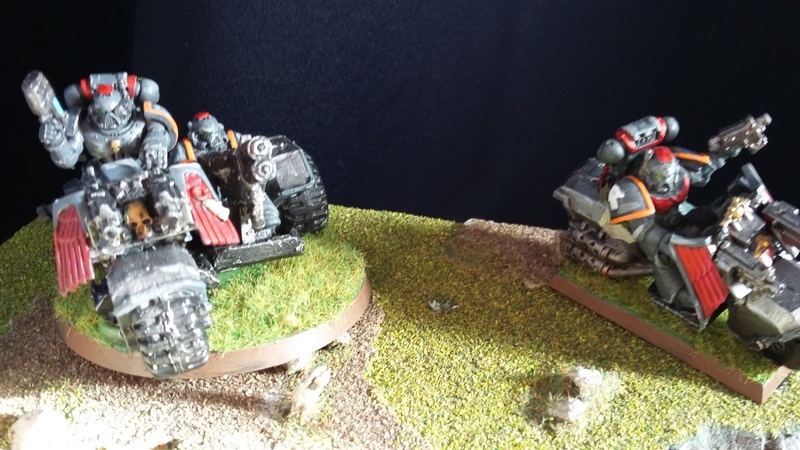 My contribution to Orktober is one that I’m not really very happy with. To use a common expression, “they’re a bugger to paint”. 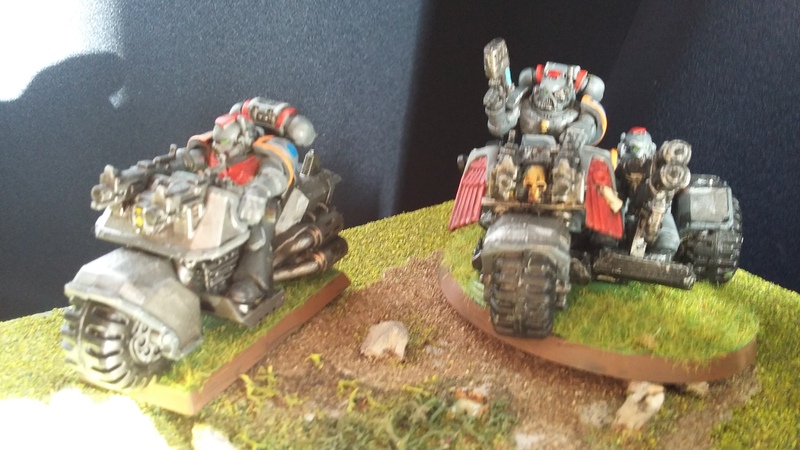 Four 2nd Edition warbikes, and a tiny RT warbike. He’s the yoof, on his practise bike! Actually, the RT bike was a pleasure to paint, but the plastic ones not so much. I simply don’t think that they are very good minis. The scale is better, but they feel like a cheap children’s toy rather than a finely detailed collector’s model! I also had to repair and rebuild them, all of them being scrap from the bitzbox. I think I did alright but compared to some of my previous Freebooter mobz I don’t get the warm glow of success! Never-mind, its all a learning curve. I present to you Magog and his Bad Ork Bikeboyz, the only survivors of an Evil Sunz warband who were wiped out by Space Marines. They survived because they drove right through the Marines and off into the distance, more into going fast than shooting. By the time they calmed down, turned round, and found the battle again there was nothing left of their old warband. Now they’re Freebooterz, willing to fight in exchange for food and fuel. Nothing for months and months and then I finish two things in quick succession! I’m quite pleased with this Rhino, considering that it is built from spare parts. The main chassis and both side constructs all came from different rhinos previously built and then wrecked by hobbyists of yore. I think I’ve covered most of the imperfections pretty well! The biggest issue I had, aside from getting the mix-n-match parts to fit together, was when I sprayed it grey. I’d heard about what can happen if you spray in a damp environment, but hadn’t really taken it in. I won’t be making that mistake again! I’ve assigned this Rhino to the 3rd Company, where it will be a dedicated transport for an assault squad. 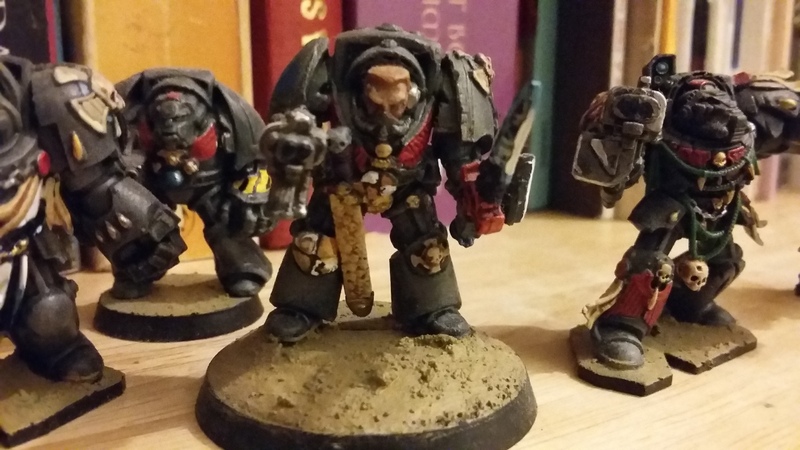 Good afternoon everyone, here’s a second set of Space Marine Honour Guard to follow the one I did a few months ago. It started as an excuse to renovate Honoured Brother Asmir, who I’ve posted before very early in this blog. Asmir got himself broken, so he needed a repair job, which I used as an excuse to put him on a base and slightly improve the paintjob. 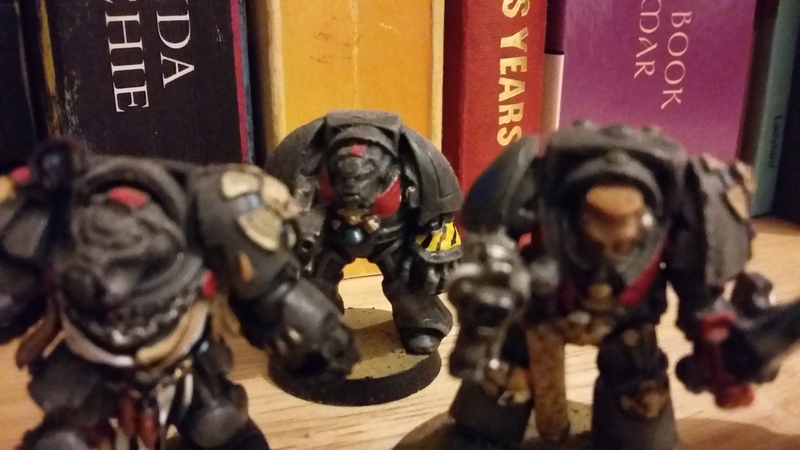 The other two are some of my favourite RT period Space Marines. 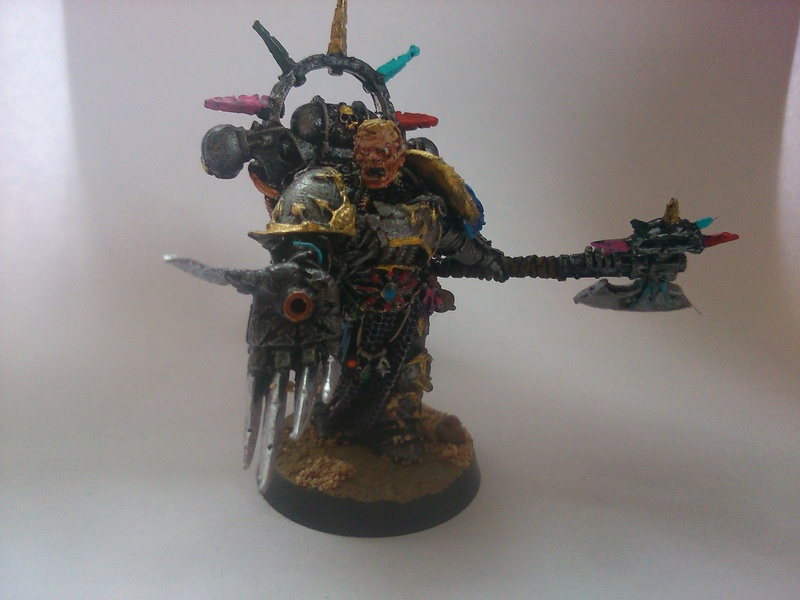 The chap with the bionic bits is a a fantastic model, I’m counting that odd sword as a relic blade! 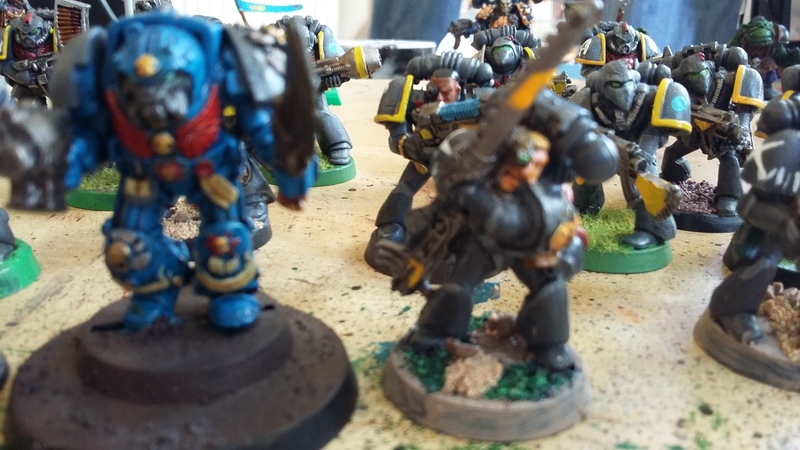 The Ultramarines Captain is another great miniature, but it took so long to paint. The Imperium is a big place. Lex Imperialis is the theoretical, but perhaps not the practical. Even in the important systems, on the key planets, there are many places to hide or avoid the gaze of the Inquisition or Adeptus Arbites. 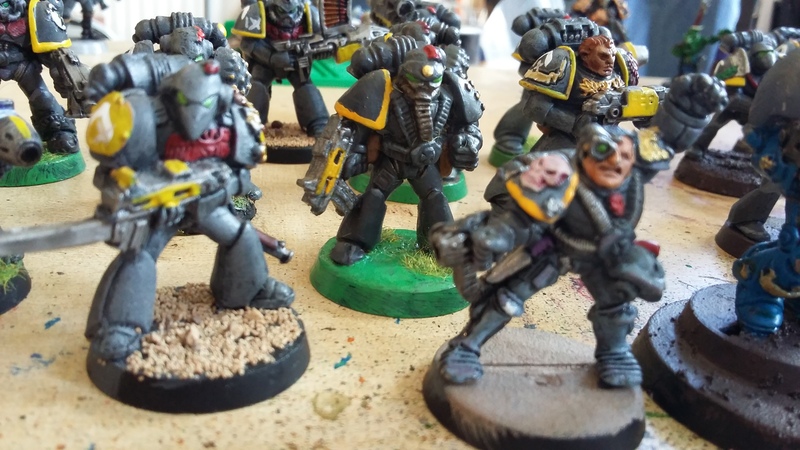 At the edges of the Imperium, where the reach of the Adeptus Terra barely stretches, many worlds are adrift from the Imperium altogether, the loyal worlds compromising on key tenets of Imperial rule, or ignoring them altogether. Thus it is that despite ten thousand years of homo sapiens chauvinism there are still dozens of thriving strains of abhuman. How’s a bloke to earn a living in a universe that says his horns are wrong? The answer, as throughout history, is piracy…. This pack of homo sapiens variatus makes a living as best it can. Perhaps they’d prefer the term ‘mercenary’ or perhaps ‘buccaneer’. They are led by Seo Jong, a huge, cunning, and violent giant of a (beast)man – the model is of course one of the recent Space Riders collection. (As a brief aside, I’d never taken part in a kickstarter before, and so I only dipped my toes in and foolishly just bought the minotaurs). Jong’s second in command, Soyuz Charlie, rocks a power glove for smashing skulls. 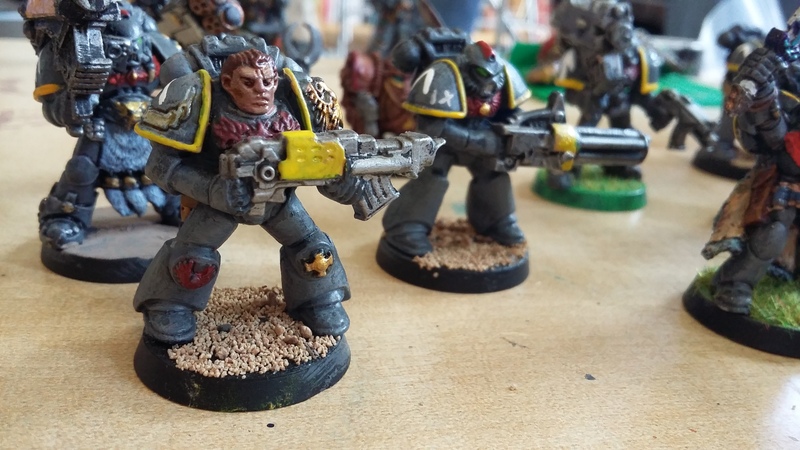 The others have an array of weapons, including a plasma gun, shootas, and their pride and joy, a conversion beamer. The two dimmest, most inbred beastmen have only axes and primitive shields. They can’t be trusted with precious modern technology. 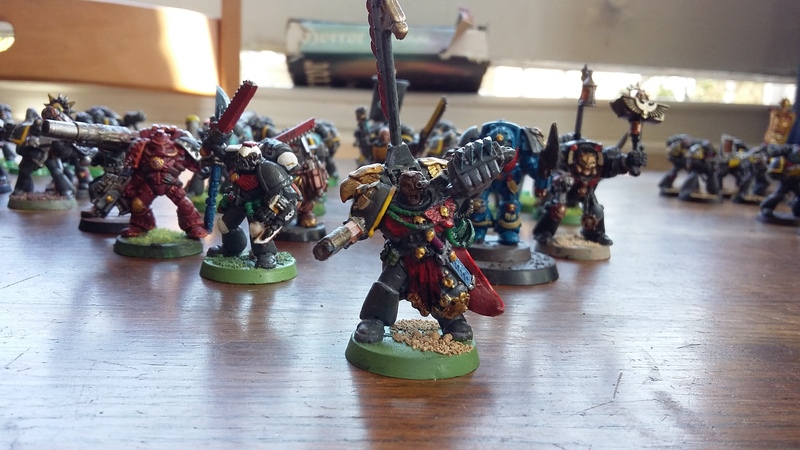 Jong’s gang move from world to world at the edges of the Ultima Segmentum, doing security, taking on paid missions wherever someone needs some muscle, or perhaps doing a bit of raiding here and there. 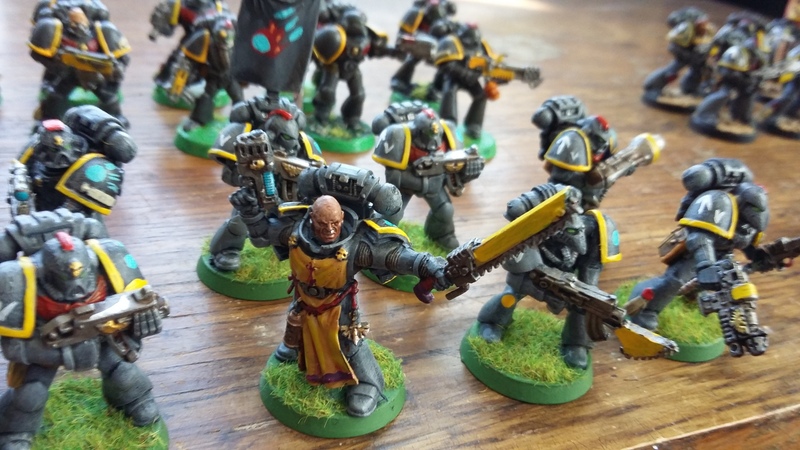 As long as there are no Space Marines or Inquisition involved, of course! Finished these yesterday, not sure what I think of them. All three were a rescue mission. The Attack Bike had previously been stripped and the plastic is kind of bubbly and rough. I think the silver and grey trim isn’t as good as I had hoped. Still, they are what they are! So I finished this gang a couple of months ago and didn’t take photos at the time because I wasn’t too happy with them. But after a couple of months sitting on the shelf I have decided to take pictures, explain the problems, and move on. Actually it should be clear what I’ve done wrong here… I’ve mixed periods too much. 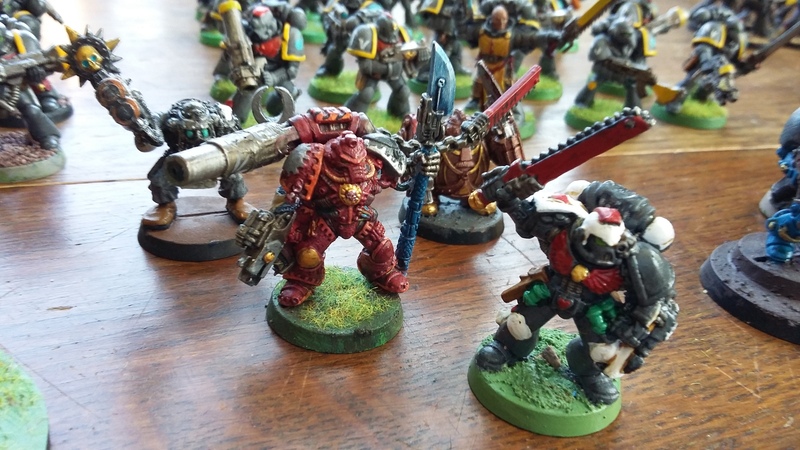 From Space Hulk to Rogue Trader to Space Hulk 3rd Edition is too much. The difference in scale and quality between the 1st Edition and 3rd Edition makes the 1st Edition Terminator look too small and too square. It really emphasises the limitations of plastic models back then, and I’m not a skilled enough painter to cover it up. I think in future that I will not mix such a wide range of models in one squad. 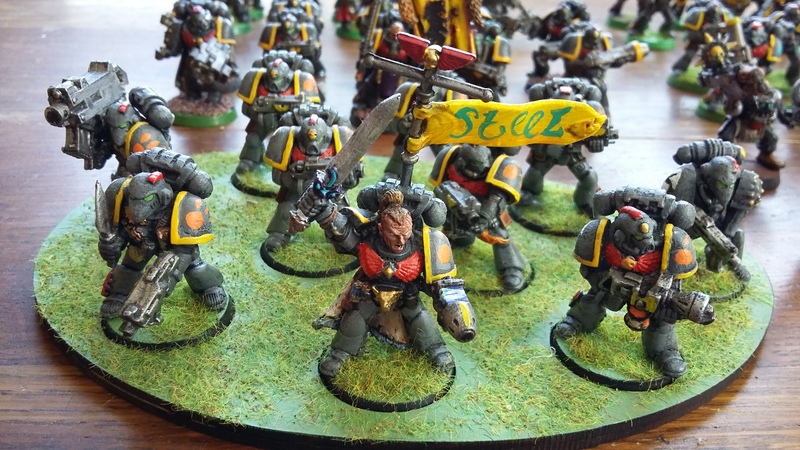 Steel Guard II Company – complete SM company! 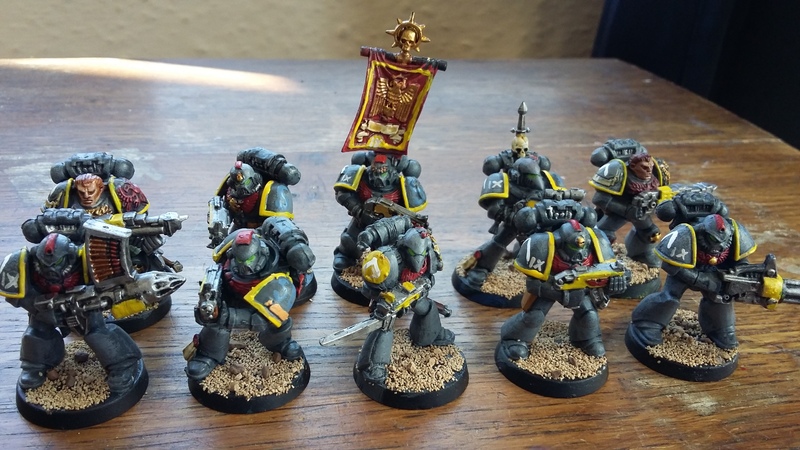 As I mentioned a couple of weeks ago I finished painting the whole 2nd Company of the Steel Guard. 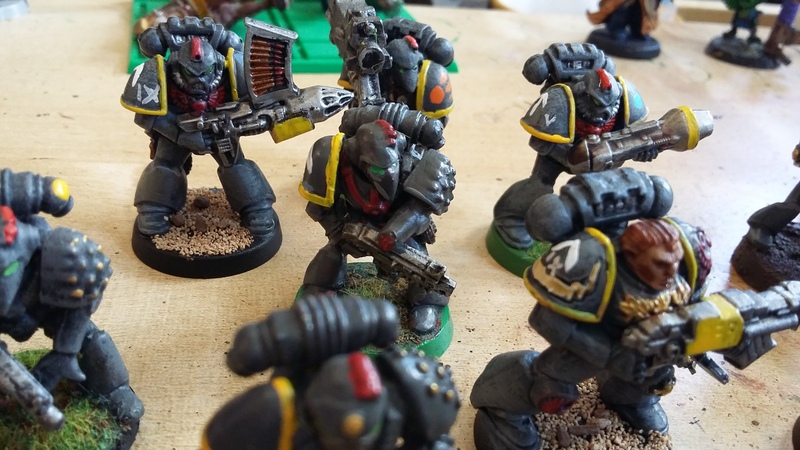 Actually, when I laid them all out to photo them I discovered I’d actually painted 11 squads! 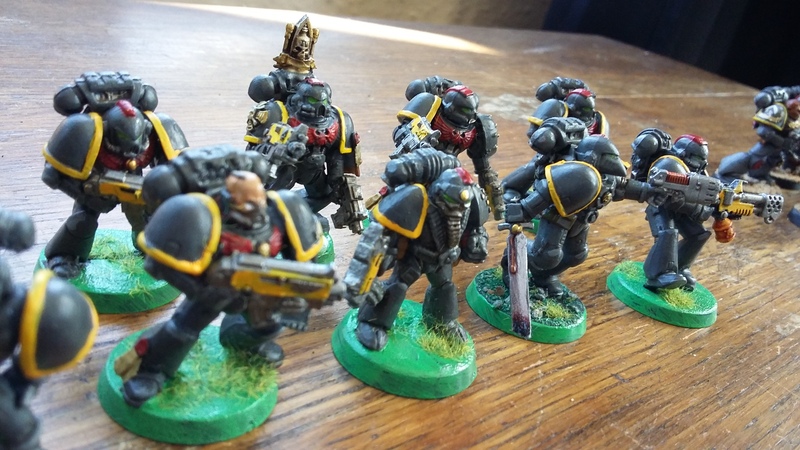 Not sure how you can miscount squads of Space Marines but I achieved it. This is the newest squad. I have started making scenic bases for them. This RT chap makes a great assault sergeant. 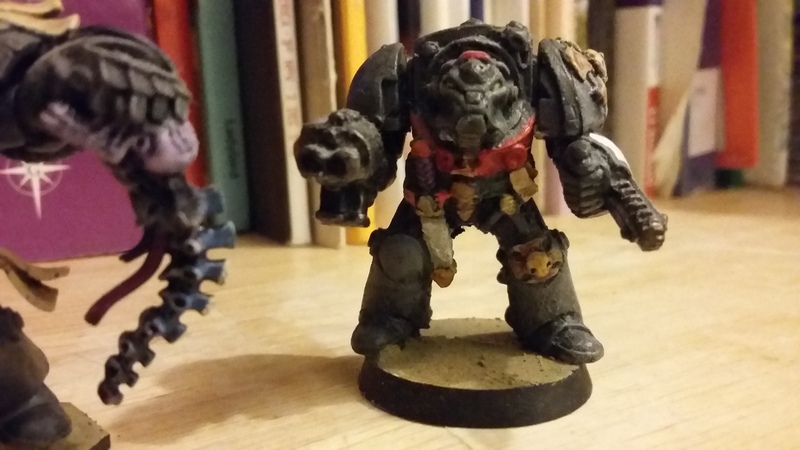 Based around a damaged mid-period Calgar miniature I converted this captain to be a close-combat monster. The gulf in quality between the earlier and later marines is huge. One of the best things about this hobby is being able to watch yourself improve. 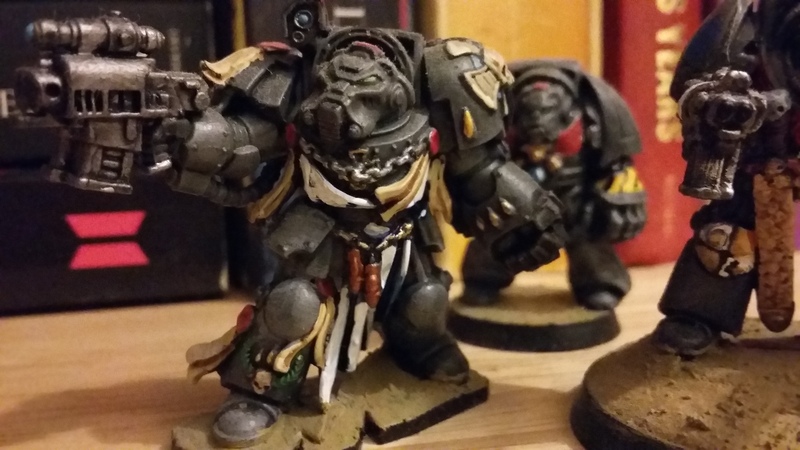 This sergeant is from Dark Vengeance. Next to him is a Rogue Trader plastic. 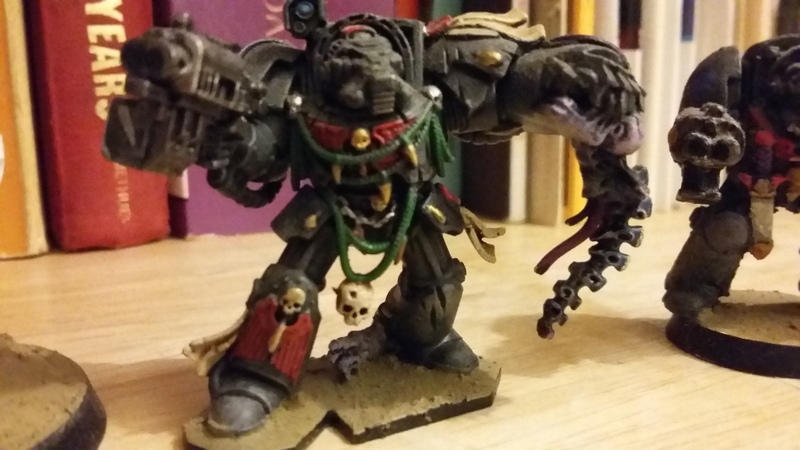 This techmarine is one of my earliest conversions. I found painting red really tricky. In the end I fixed upon using the astronomical icon for ‘comet’ as their insignia. I tried out different iconography as I went along. 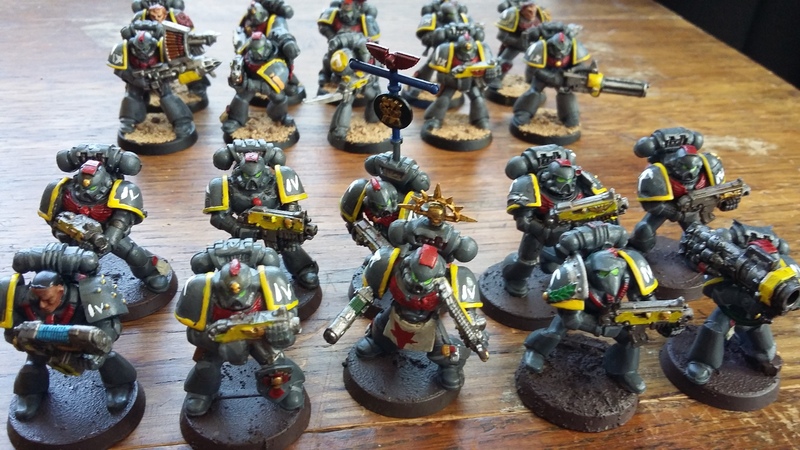 I’ve recently finished painting the final squad of the Steel Guard 2nd Company. Well, I finished it a couple of weeks ago but I didn’t get around to photographing it until today. But if you want to see what an entire company looks like you’re going to have to wait another day or two. First of all I am indulging the spirit of Rogue Trader and Oldhammer. 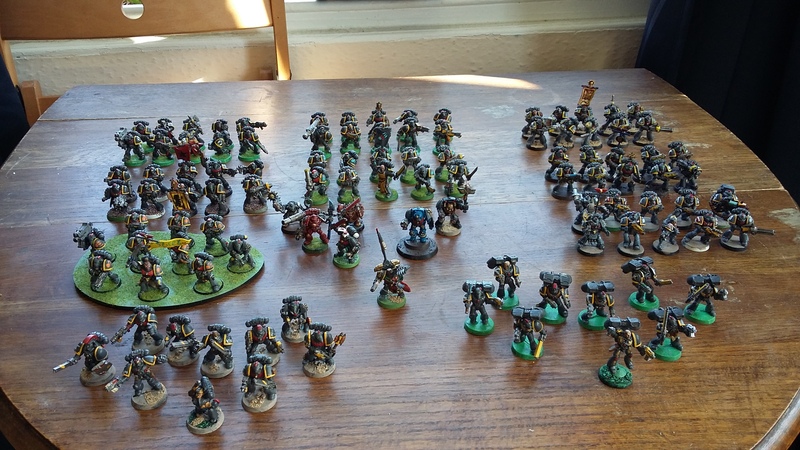 Presented below is a Rogue Trader Marine Army (with a few 2nd ed. marines hanging out too). 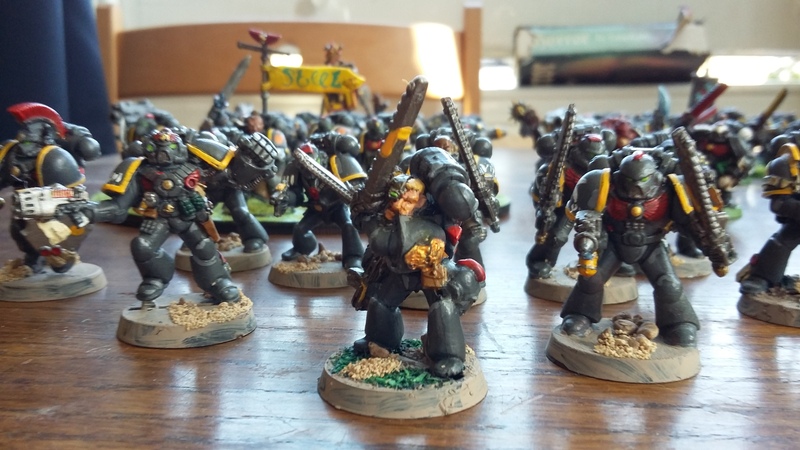 These are all the RT-era Marines in the company. 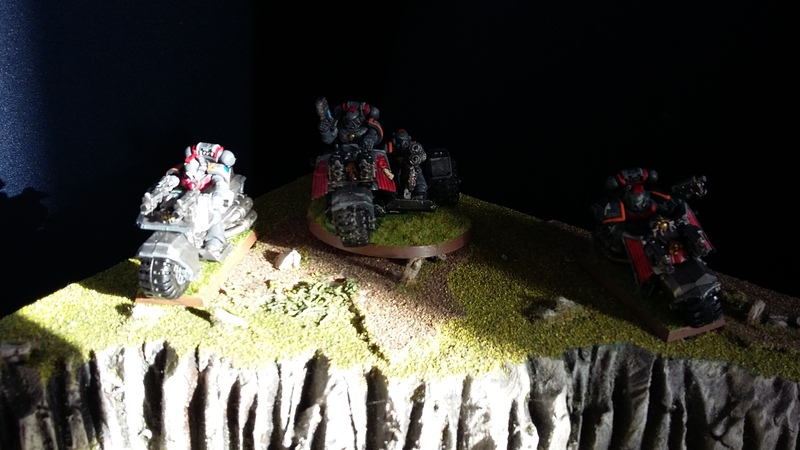 I know the photo isn’t very well taken, but I reckon this would look damn fine on the tabletop. I hope you agree! 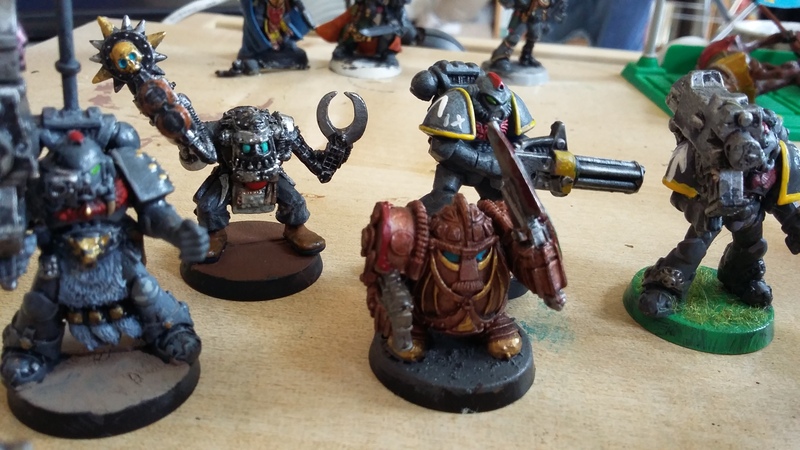 Oh, a squat warlord and a servitor have slipped in there too. Just because that’s what happens in Rogue Trader.